Waterfalls in Malappuram are located at the hilly east where hill stations such as Kakkadampoyil and nedumkayam are in the early stages of getting tourism spotlight. Leaving aside tiny waterfalls, the ones with tourism significance are Adyanpara, Keralamkundu, Kozhippara and Oli falls. All of them are located in the outskirts of Nilambur, a regional town with several tourist attractions. Nilambur is a good place to chill out for a day or two. There are teak gardens and other attractions. Adyanpara, the best known of all waterfalls in Malappuram, is located about 10 kms north of Nilambur. The stream flows along a rocky terrain at the forest fringe. For adventure, there are woods to explore and rocks to climb. Be careful while walking and climbing since the rocks are slippery. You will also find quite a few birds. During summer the waterfall almost dries up. Still people visit here for the fun of walking over the rocks, enjoying the trickles of water flow and playing in the small pools. If you are visiting here in summer, avoid noon time because the rocks get really hot. This small glittering cascade attracts mostly youngsters who enjoy jumping into the large pool below. Situated in the buffer zone of Silent Valley National Park, the landscape is green and gorgeous. The regional centre is Karuvaramkundu, where there are shops and transport. The distance from the shops to the waterfall is about 6 kms. Similar to Adyanpara, here too you will find rocks that get slippery easily. Hence better to avoid here during heavy rains. This cascade is known by a few other names - Karuvaramkundu waterfall, Kalkundu falls and Nutmeg Valley waterfall. 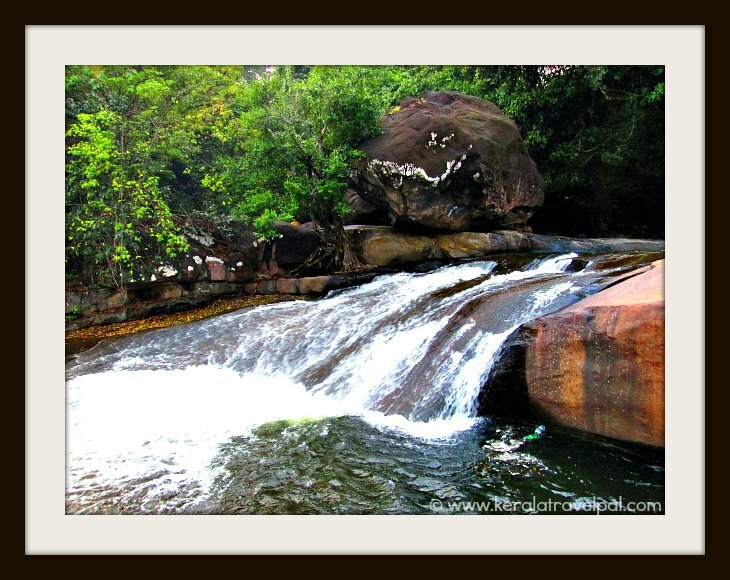 Kozhippara waterfall is a major highlight of Kakkadampoyil hill station. It is located at Vallamthodu near the border to Kozhikode. Hence it is also called Vallamthodu waterfall. While excellent scenery is a major drawcard, there is also scope for swimming and trekking. This is also a great picnic spot where you could bring food and enjoy in a group setting. Kozhippara waterfall is about 24 kms from Nilambur. Oly is a waterfall created by a stream that twists down along a rock. Getting near the water is dangerous because of the sloppy surface. Overlooked by leafy branches on one side, the place is pristine and without crowds. Also called Pullippadam Oly falls it is at Odayikkal in Mampad, about 15 mintes drive (10 kms) from Nilambur. This is not a widely known travel spot and only reached by a handful of locals. Pathar village is about 20 kms north of Nilambur. The pool down the waterfall is quite big and people do swim there. You need to walk a few hundred metres to reach the waterfall. The path through the plants is hard to find. So it is better to have a local to guide you.